Expedition is a unique mixture of impactful projects, personal discovery and true adventure. Expedition brings young people together from all over the world to create change. Change in the communities you work in, change in the environments you live in and change in yourself. We need volunteers aged 17-24 to help deliver our sustainable development programmes in remote communities around the world. Volunteers live in a homestay with a local family, work on sustainable projects in remote communities or national parks with an international team, and trek through unique and stunning landscapes. You will be challenged to achieve things you didn’t know you were capable of and return home with the power to create lasting change. Visit the world’s highest country on a Nepal Expedition and experience the famous Nepali hospitality and if you are lucky, a festival or two. Immerse yourself in a remote Nepalese community – learn about local life and customs. Work on meaningful community led projects, contributing to the Global Goals. Take part in an adrenaline-fuelled adventure trek. Challenge yourself, get muddy, see amazing scenery & wildlife and sleep under the stars. Make your CV stand out – develop key skills that will set you up for the future. Make genuine, lasting friendships and grow a network which covers the globe. You’ll stay with local families in communities on the foothills of the Himalayas. A stunning country, Nepal is home to eight of the world’s ten tallest mountains; snowy peaks and fluttering prayer flags will dominate your view. On your Nepal Expedition, you’ll be enchanted by the country’s landscape and friendly people. A five, seven or 10-week Expedition in Nepal provides exposure to different people, new cultures, situations, and environments. You will get the chance to take part in up to three projects, dependent on the length of your Expedition: Community, Environmental and Adventure. 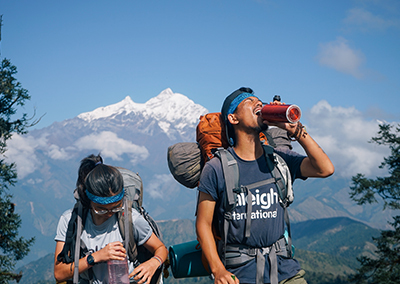 A Raleigh expedition in Nepal is a unique opportunity to help raise environmental awareness and tackle poverty, whilst experiencing real Nepal. During your community project you will improve access to water and sanitation facilities for those still struggling after the earthquake. You will be living and working alongside a Nepalese community. You’ll be working on a water and sanitation project to help improve access to drinking water, handwashing and toilet facilities, as well as raising awareness of these issues in the community. Your team will be working alongside local project partners and community members to create lasting change. You could be helping construct toilets one day and be building handwashing stations the next. It might be hard work at times but your effort and energy will make a real difference. And in your adventure phase you will trek through the stunning Ruby Valley (climbing over 2900m) and pass through rural mountain villages. This is an adrenaline-fuelled adventure trek in the Ruby Valley in Dhading. You’ll trek up hills, through local villages, beautiful farm terraces and see stunning views of the central Himalayas. Led by our local guides and Raleigh leaders, your trek will allow you to explore the incredible scenery that Nepal is famed for. After a day’s trekking through the foothills of the Himalayas, you and your team will set up camp out under the stars and cook outside together. It’s a pretty magical time. It might be hard work at times but your effort and energy will make a difference.